UPDATE: Awesome Screenshot 3.7.12 now offers an 'opt-out' setting to address this (but it's on by default) - read my new article here. Back in June, my OSSEC logs alerted me to some web crawling activity by a crawler with a user-agent of 'niki-bot'. Chances are if you grep or analyse your web logs, you've seen it too. 64.79.85.202 - - [09/Aug/2014:15:40:37 +0100] "GET /node/6059128/webform/configure HTTP/1.1" 403 4474 "-" "niki-bot"
64.79.85.202 - - [09/Aug/2014:15:39:39 +0100] "GET /admin/structure/pages/edit/node_view HTTP/1.1" 403 4483 "-" "niki-bot"
64.79.85.202 - - [09/Aug/2014:06:59:44 +0100] "GET /node/add_to_group/257998 HTTP/1.1" 403 22037 "-" "niki-bot"
Hmm. Very specific URLs relating to certain Drupal websites within the infrastructure. Not just arbitrary, opportunistic URLs such as /user/register, but actual edit pages of specific nodes that do exist. 64.79.85.202 - - [15/Jul/2014:21:42:02 -0400] "GET /view/Deployments/job/Deploy_XXXXXXXXX_application HTTP/1.1" 400 264 "-" "niki-bot"
Wow, that's very specific. That job definitely exists, but only staff who are logged in can see it. 64.79.85.202 - - [31/May/2014:22:59:40 +0100] "GET /client/some-project/merge_requests/22 HTTP/1.1" 400 264 "-" "niki-bot"
Wow, a merge request URL. WTF? See any common theme (other than, in these cases, the IP address)? These are very specific URLs that definitely do exist, but are effectively behind an 'auth-wall' which no normal bot can access. These are not URLs linked anywhere, and hence why no 'normal' crawler such as Googlebot etc ever finds them. Yet niki-bot does. Somewhat alarmed, we collated via OSSEC all cases of the logs, and gradually a picture began to emerge. Even early on in the investigation, I was 90% sure that these were all URLs that a specific staff member had visited. We had all visited many of them, but one user in particular was likely to have visited all of them due to the nature of their role. Virus scans showed up nothing on his computer. I was not the only one to experience this, but maddeningly, there was not much reported on the internet about it. One other person had reported a similar issue, regarding a Google AppEngine URL that only he could have used. He had had no response. Email correspondence at the time has me saying in June, "The only way these URLs would be found is client-side. Maybe some browser plugin maliciously recording someone's (Bob's?) browsing history?". Finally, Bob reviewed his browser extensions, and we were able to determine the only extension we couldn't be 100% sure of was 'Awesome Screenshot' by Diigo. The extension was subsequently disabled, but we still didn't know for sure if that was the culprit. Time passed and we moved on. As I found out, the attacker used the URLs, which were provided to him by chrome extension. In my case it was awesomescreenshot extension in Google Chrome, which leaked all the internal pages (in admin account) I was visiting myself. So the bot later just pinged those. When extension is installed basically it receives access to all the pages URLs you visit. I just removed the extension, now in doubts whether I need to reset all password of all my accounts, because potentially cookies also could be leaked. If you try to navigate to http://s1821.crdui.com/service2 it will redirect you to http://t1.webovernet.com/service2. You can drop api28.webovernet.com and the other site into your browser to see where they lead, but we’ll save you the suspense: they are actually redirects for the API for a company called Similar Web, which is one of many companies doing this kind of tracking, and selling the data so other companies can spy on what their competitors are doing. None of the articles that explain the tracking by the extension, seem aware that the niki-bot crawler appears to return back to URLs harvested from such extensions as Awesome Screenshot, for who knows what purpose (reconnaissance of some sort?). That's fair enough, these guys may not be sysadmins with access to web logs. But per the AppEngine case, there was clearly a link. 1) What is the relationship between crdui.com and webovernet.com/similarweb.com ? 2) What is the relationship between these and niki-bot? Looking into crdui.com, which is a 'domains by proxy' privately-registered domain name like webovernet is, I noticed it was registered on December 24, 2013. Lo and behold, that just happens to be the date that my logs pick up niki-bot for the first time! 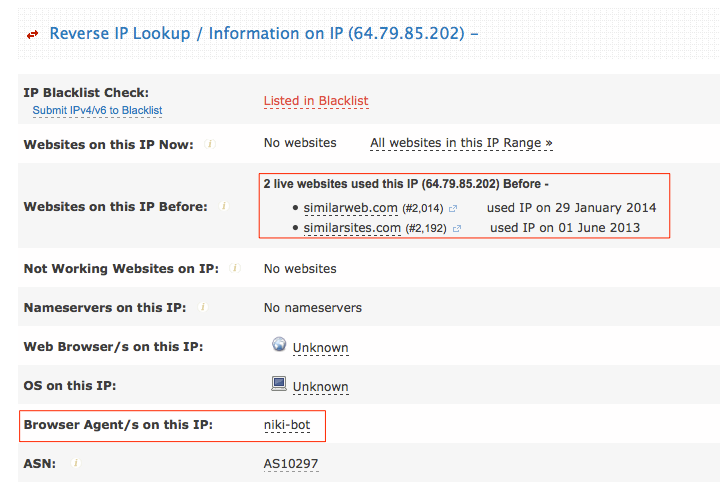 Meanwhile, other online services appear to link the IP 64.79.85.202 to both similarweb.com and niki-bot. At least two IPs in my logs have been used by niki-bot: 209.190.113.82 and 64.79.85.202. These are in the 209.190.0.0/17 and 64.79.64.0/19 subnets announced by AS10297, belonging to eNET, Inc.
t1.webovernet.com, mentioned in one of the above articles, resolves to two IPs 209.190.8.242 and 64.79.86.18. Both in the same subnets as the above. The Bitcoin service BitBargain, only 2 days ago, also wrote about the niki-bot and had their attention brought to it same as me - the 'secret' URLs standing out in the logs. Independently from my research, they were able to cross-reference the IP 64.79.85.202 to a known Adware executable called similarwebie.exe. The plot thickens! Their case may not have been from Awesome Screenshot - as Howtogeek reports, other Chrome extensions such as Hoverzoom have been known to send data to the webovernet service too. However, that extension, according to the article, at least offers an opt-out checkbox in its settings page. The connection between these services and the niki-bot are still not clear to me, and perhaps never will be. I think it's unlikely that the crawler tool belongs to Awesome Screenshot, but more likely is part of a wider set of tools belonging to the advertising companies etc. I don't think it or the screenshot extension are used to harvest sensitive credentials, but clearly there is some sort of market value perceived in crawling the URLs for data later. Analysing the traffic in Wireshark the POST data appears to be twice base64-encoded (why?) and sent over plaintext to those URLs. Decoding the data shows essentially the URL string you visited. I couldn't find evidence that it captures or sends cookies or the actual POST data that is, say, sent in a login form (using gmail.com as a test) - just the URLs. Some people in the links/reviews have claimed it captures their session data but I didn't see this myself. 0000  52 54 00 12 35 02 08 00 27 c0 fe bb 08 00 45 00   RT..5...'.....E.
0020  78 c8 df 8f 00 50 56 f5 2d 1c 0f e2 68 02 50 18   x....PV.-...h.P. 0160  75 20 43 68 72 6f 6d 69 75 6d 2f 33 36 2e 30 2e   u Chromium/36.0. 01f0  69 70 2c 64 65 66 6c 61 74 65 2c 73 64 63 68 0d   ip,deflate,sdch. 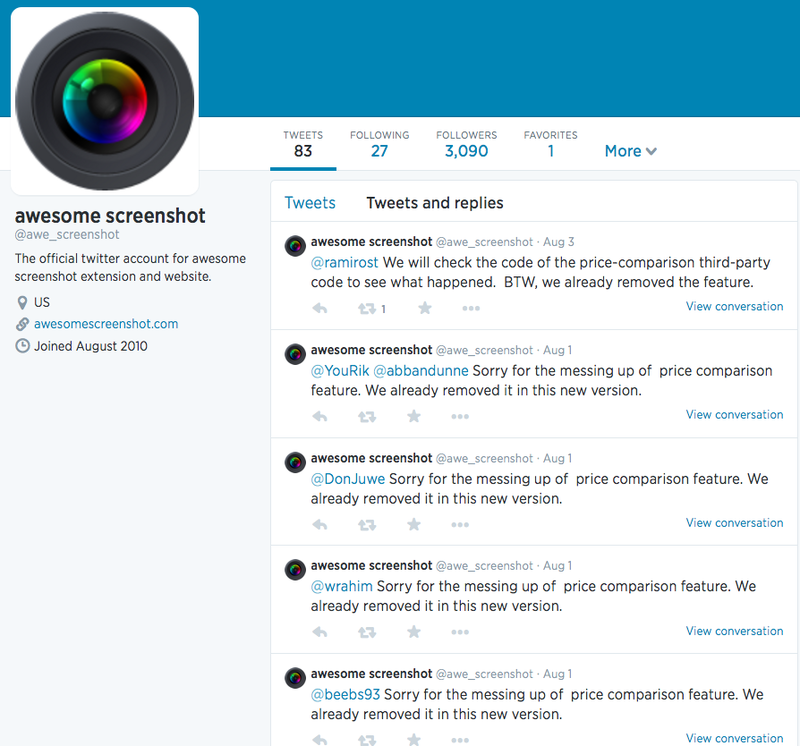 Furthermore, there appears no way to turn off this feature, even though Awesome Screenshot's Twitter feed is full of apologies to users 10 or so days ago from time of writing, apparently regarding a now-disabled 'price comparison' functionality that was also being injected. The tracking and transmission of your browsing history is happening automatically, silently, with no proper explanation in the extension's details on the Chrome App Store. The potentially sensitive URLs are sent over plaintext HTTP in easily base64-decryptable form, and through the use of some 'niki-bot' crawler (which is apparently so malicious its User-Agent requires obfuscation with no reference to SimilarWeb, Awesome Screenshot, or any other explanation for its use - nor does it bother to respect robots.txt), seems to intend to make further reconnaissance against these URLs at a later date. I see little difference between a client-side attack and this 'service', except that it can be argued that the end user willingly (but maybe unwittingly) entered into the agreement. Why is this functionality necessary for a screenshot tool? If it's not necessary, why is there no opt-out? When users access the software, certain non-personally and personally identifiable information (the "User Information") may be collected, stored and used for business and marketing purposes, such as maintaining and improving the Services, conducting research, and monetization. This User Information includes, without limitation: IP address, unique identifier number, operating system, browser information, URLs visited, data from URLs loaded and pages viewed, search queries entered, social connections, profile properties, contact details, usage data, and other behavioral, software and hardware information. If you access the Services from a mobile or other device, we may collect a unique device identifier assigned to that device or other information for that device in order to serve content to it. This collected data may also be supplemented with information obtained from third parties or submitted by users. Funny to see 'anonymized', 'personally identifiable information' and 'unique device identifier' listed in the same context. Without 'limitation'. Of course, any URL that is not completely firewalled off and reachable by a bot in some way (even if it 403s etc due to ACLs), is technically not 'private'. However, as @aussielunix noted, this client-side attack of sniffing traffic straight out of the browser would lead to exposure of things such as Private Gists at Github - hard-to-guess URLs that are not entirely private but also not intended for chance discovery, for whatever reason. Furthermore, how anonymous is it when a crawler returns later to check the URL out? How is it anonymous when I can identify, based on this crawler, which user had installed the extension at one of the organisations I'm involved with, based on URLs that are not intended for third parties to know about? What about Dropbox share URLs, Spideroak temporary URLs? Or, in Bitbargain's case above, 'unique trade ID URLs... accessible only to the buyer and the seller involved in the trades'. The fact is, URLs aren't anonymous. Any simple URL such as www.example.com/user/1234/edit, immediately indicates something other than 'anonymous' activity. Like all metadata, it can infer identity, infer activity. Naturally any form of client-side compromise, keyloggers etc, runs the same risk of this sort of exposure of your browsing history. Tracking of user activity like this, is perhaps not even illegal (though I am astonished that Chrome allows it in this extension's case, given there seems no way to opt out! ), since the advertising company can hide behind the veneer of 'market research' and 'analytics' to help their customers gain 'a competitive edge', yadda yadda. It's a bit much in my opinion, though, to keep this a secret from users who are installing what appears to be a very popular browser extension, not to mention the apparent lack of opt-out functionality. It consistently came as a surprise to the users I spoke with who installed this tool that this was happening. When installing the extension, Chrome requires confirmation to allow the extension to 'Access your data on all websites / access your tabs and browsing activity'. Take the time to read this, and be aware that this means 'watch everything you do online, potentially reporting it to third parties silently'. My advice is to disable this extension if you use it (and any such extensions that require such absurd permissions to your data), and also to report it to Chrome to see what their assessment is. P.S How funny that there's a similarly named Android malware called 'Nickibot' whose purpose is to "steal information and send it to a remote server". Wow, that sounds familiar!